For last week’s book excerpt from the Energy Drink Guide, we talked about where we get Vitamin B6 (aside from energy drinks, other sports supplements, and fortified foods like breakfast cereals). This week’s book excerpt is about what vitamin B6 does. Vitamin B6 helps the body make protein. Ever heard of essential and non-essential amino acids? Vitamin B6 helps our bodies make those non-essential amino acids…(through a process called transamination, for you biochem nerds). B6 also helps us maintain optimal blood sugar levels. Gluconeogenesis = creating new glucose. Glycogenolysis = breaking down the stored form of glucose into its itty-bitty pieces. Breaking down the stored form of glucose means we can tap into those reserves when we need them. And this isn’t just for emergencies – our bodies go through glycogenolysis all the time. If B-vitamins were all Marvel Avengers, Vitamin B6 would be another star member, like thiamin, riboflavin, and especially (my favorite) niacin. Vitamin B6 has several more jobs that are important and not boring like other vitamins (*cough, #boringbasicbiotin ) BUT we’ll have to talk about that next week and/or you’ll have to get a copy of my book “Are You a Monster or a Rock Star: A Guide to Energy Drinks – How They Work, Why They Work, How To Use Them Safely” available on Audible, Amazon, and wherever books are sold. To learn more about riboflavin and the other B-vitamins, stay tuned for next week’s book excerpt as we continue our page-by-page exploration through the Energy Drink Guide. For this week’s book excerpt from the Energy Drink Guide, we enter the Vitamin B6 chapter of Part Three: How Do They Work. Vitamin B6 is often included in energy drinks, AS WELL AS many other sports supplements! Before we get into what B6 does, let’s talk about where we get it. We get B6 from MUSCLES! When we get to what B6 does, it will become obvious why B6 lives in muscles. Meat and fish are the best sources of B6 because meat has muscles…Potatoes have eyes though. (ha-ha-ha…) Potatoes are a good source of B6, as well as carrots, spinach, avocados, and bananas. Stay tuned for more book excerpts from my book about energy drinks and their ingredients, “Are You a Monster or a Rock Star: A Guide to Energy Drinks, How They Work, Why They Work How To Use Them Safely” available on Audible and also on Amazon as an e-book, paperback, and hardcover! For the 10th and final day of the GreenEyedGuide Caffeine Challenge we review the 10 things on a label to check before consuming a caffeinated beverage or other health/functional beverage. Thank you for playing along with the Caffeine Challenge! You can always share your favorite caffeinated beverages with me on Instagram/ Facebook/Twitter and tag @GreenEyedGuide. Through this challenge, you’ll learn how to use the 5 Levels of Fatigue to reap the benefits of caffeine while avoiding addiction, dependence, tolerance, and toxicity. One of the many reasons I decided to write an energy drink book is “bull sperm”. 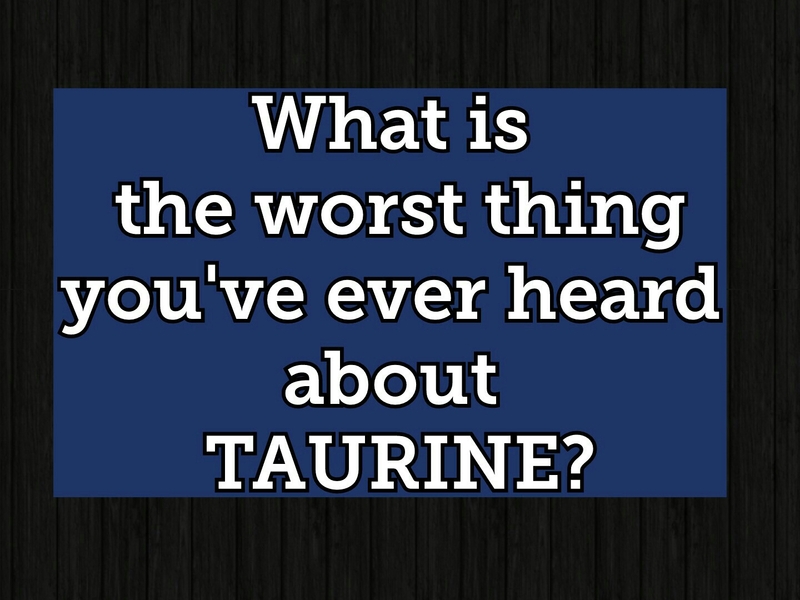 I kid* you not, there were people out there who insisted taurine was a fancy name for bull sperm. They were younger people, hence the “*”, but I couldn’t stand this gross eggageration (so.many.puns). Fact-taurine was first isolated from ox bile in 1822. The name comes from Bos taurus, the genus and species of ox. 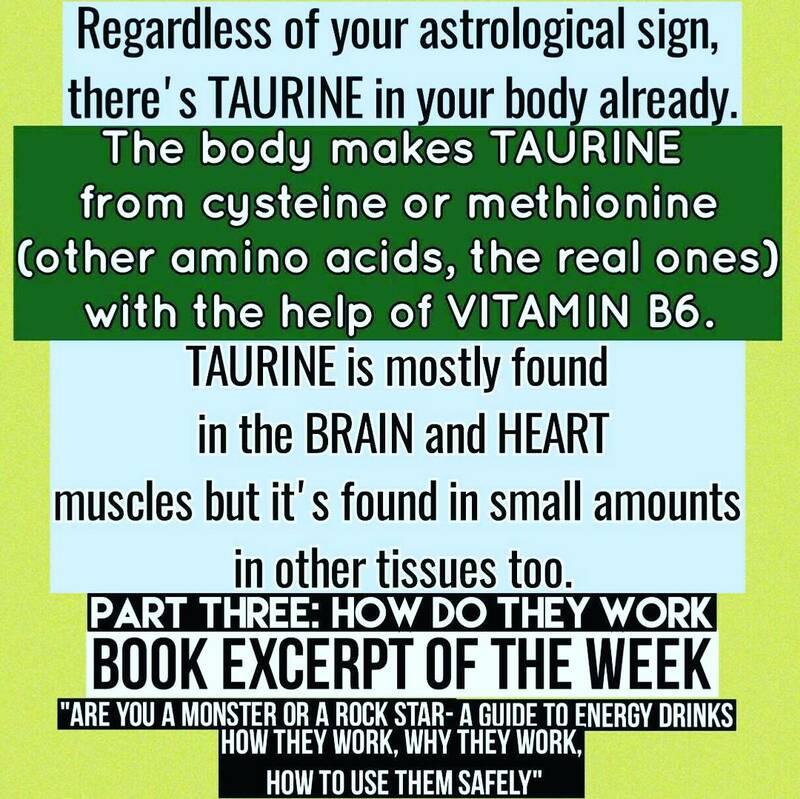 Okay, so then what is taurine, really? Taurine is an amino acid, just not the kind of amino acid that is a “building block” for protein. So what does it DO? WHY is it in energy drinks? For that answer, stay tuned for next week’s book excerpt, as we continue through Part THREE of the Energy Drink Guide. We’ll discuss the WHAT IS IT, WHAT DOES IT DO, HOW MUCH IS TO MUCH for 30 of the most common energy drink ingredients. Get your copy of my book, ” Are You a Monster or a Rock Star-A Guide to Energy Drinks: How They Work, Why They Work, How to Use Them Safely” on Amazon and wherever books are sold.